Spend on Trend is an annual event in Vancouver which features 30 local independent designers. This event is often used by designers to launch their new collections. Find long-time favourites like Elroy Apparel, Adhesif Clothing, Filou Designs and Astrosatchel as well as emerging artisans such as Mulierose, Viva Diosa and Meiku Designs. The event is organized by Fiona Louie of Filou Designs. Here’s a little insight into this great event from her perspective. What’s the story behind Spend on Trend? Spend on Trend was started by two talented Vancouver designers in 2004. I joined the show as an emerging designer in 2005. In 2009, I was given the opportunity to take over the show. I always enjoyed being a designer at Spend on Trend because I enjoyed the company of the other designers and the shoppers who visited, an overall warm and friendly place to grow a young business in the arts. I wanted the show to continue, so my hubby and I took the project up together as co-producers. Over the years, we’ve had great help and advice from Nicole (from Nicole Stewart PR) and this year we’ve been fortunate to have additional help from Lindsay O’Grady, who specializes in marketing and communications. How does Spend on Trend differ from other shows in the city? Spend on Trend is a small boutique event, showcasing up to 30 designers. With a smaller group, designers get to know each other and it offers more opportunity to get noticed. Spend on Trend has received a lot of support from the media, which really helps the designers bring their new brands and collections into the public eye. Shoppers also appreciate the one on one experience when purchasing from the designer themselves. We’re proud to have hosted many of Vancouver’s established brands as emerging stars. We are also excited to see new designers join us, as we’re sure there are many gems hidden among them. It’s no wonder that shop owners come by to get the latest scoop on our talent. When you’re not planning shows or your next collection, what do you do to relax? I love to Travel. Though, traveling isn’t always relaxing. So, the ultimate relaxing day in town may include biking to Trout Lake Farmers Market, doing yoga, or going to my local hide-outs around Commercial Drive and East Village. What is your favourite thing about Vancouver? I grew up in Vancouver so it took quite a bit of traveling and living overseas to truly appreciate how unique a city it is. We’ve got beautiful, beautiful nature, great food…and a flourishing local design scene. 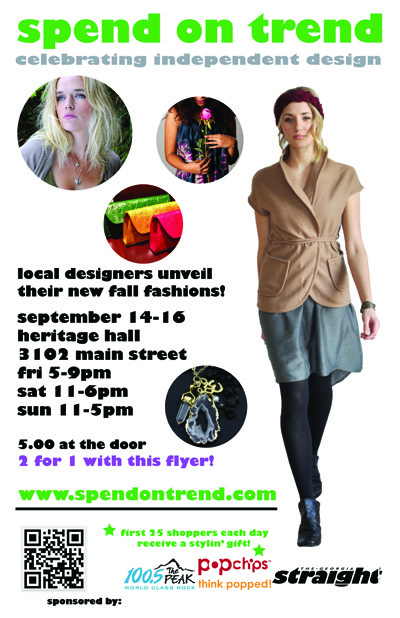 Filou Designs (www.filoudesigns.com) can be seen along with other local designers Sept 14-16 at Spend on Trend (www.spendontrend.com). This entry was posted in Uncategorized and tagged Adhesif Clothing, Astrosatchel, Elroy Apparel, Filou Designs, Heritage Hall, Meiku Designs, Mulierose, shop local, Spend on Trend, vancouver, Viva Diosa. Bookmark the permalink.